The first Arab invasion to India was made by Muhammad bin Qasim (AD712). Sindh was the first place in India captured by Muhammad bin Qasim. Dahir was the ruler of Sindh during the aggression of Qasim. Dahir was killed in the Battle of Aror on the banks of the Indus River by Muhammad bin Qasim. Mahmud of Ghazni attacked India 17 times between 1000 and 1027 AD. He invades and plundered parts of the Indian subcontinent. Mahmud of Ghazni was the first ruler to hod the title Sultan. In 1000AD he led the first expedition to India, against Peshawar. Mahmud Ghazni defeated Jayapala in the First Battle of Waihind in 1001 AD. In 1025AD, Mahmud Ghazni attacked the famous Somnath temple in Gujarat. The famous Persian poet Firdousi and Persian Scholar Al Beruni adorned the court of Mahmud Ghazni, when they came to India with him. Firdousi was called as 'the Lord of the Word'. Firdousi was known as the Savior of the Persian Language. Firdousi was known as the Persian Homar. He wrote the Persian epic poem Shahnameh (The Book of Kings). Al Beruni was the first Muslim Scholar to study India and its Brahmanical tradition. Al Beruni in his book Kitab-ul-Hind appreciated a very high degree of proficiency of Indians in construction of Tanks and reserviors at holy places. Tarikh Al Hind was written by Al Beruni. Al Beruni, the writer of Tarikh-i-Hind accompanied him during his expeditions. Al Beruni was the founder of Indology. Muhammad Ghori invaded India and laid the Muslim Kingdom in India. He was the true founder of the Muslim rule in India. In his third expedition, he fought the first Battle of Tarain in 1191 AD with Prithviraj III of Chauhana dynasty. Ghori was defeated by Prithviraj Chauhan in the first Battle of Tarain. In Second Battle of Tarain 1192 AD, he defeated Prithviraj Chauhan. The Second Battle of Tarain laid the foundation for the Muslim rule in India. After the Second Battle of Tarain, delhi came under the control of Muslim rulers. In 1193 in the Battle of Chandwar, Ghori defeated the king Jayachandra. After hw left India, the territories were handed over to Qutubuddin Aibak. Qutubuddin Aibak was a slave of Muhammad Ghori. Bakhtiyar Khilji was his main commander. Bakhtiyar Khilji destroyed Nalanda and Vikramshila Universities in Bihar in 1193AD. After the death of Muhammad Ghori, the slave Qutubuddin Aibak ascended the throne in 1206. 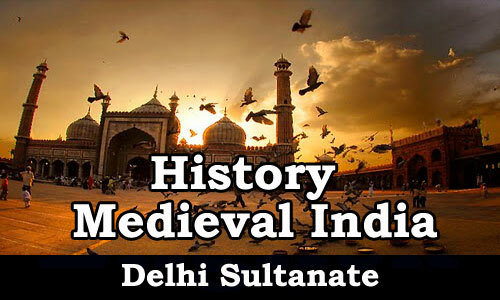 Delhi Sultanate spanned five dynasties, 32 rulers and 320 years. Slave, Khilji, Tughlaq, Sayyid and Lodi were the five dynasties of the Delhi Sultanates. Slave Dynasty was the first Muslim dynasty in India. Slave Dynasty was known as the IIbari dynasty and sometimes called as the Mameluq dynasty, which means 'Slave born of free parents'. Qutubuddin Aibak was the founder of Slave dynasty. Qutubuddin Aibak was the first Sultan of Delhi and the founder of the Ghulam dynasty. He was known as 'Lakh Bakhsh'. He was started the work of Qutub Minar in Delhi. Qutub Minar was named after the Dufi saint Qutub-Ud-Din Bakhtiyar Kaki. He built Quwwat ul Islam Mosque at Delhi and Adhai Din Ka Jhonpra Mosque at Ajmer. The scholars like Hasan Nizami and Fakremudin adorned his court. Hasan Nizami wrote the book Tajul-Ma'asir. Tajul-Ma'asir was the first official history of the Delhi Sultanate. He founded the Qutbi dynasty. He died while plalying Chaughan (Polo). His burial place is at Lahore. Qutubuddin Aibak was succeeded by Aram Shah. Iltutmish was considered as the real founder of Slave dynasty. He was known as 'Sulthan-i-Asam'. Qutubuddin Aibak was succeeded by Aram shah but Iltutmish removed him. Third Battle of Tarain was fought between Iltutmish and Yalduz in 1215 AD. Iltutmish defeated Yalduz. Sultan Ghari was constructed the first Islamic Mausoleum (tomb) in India.